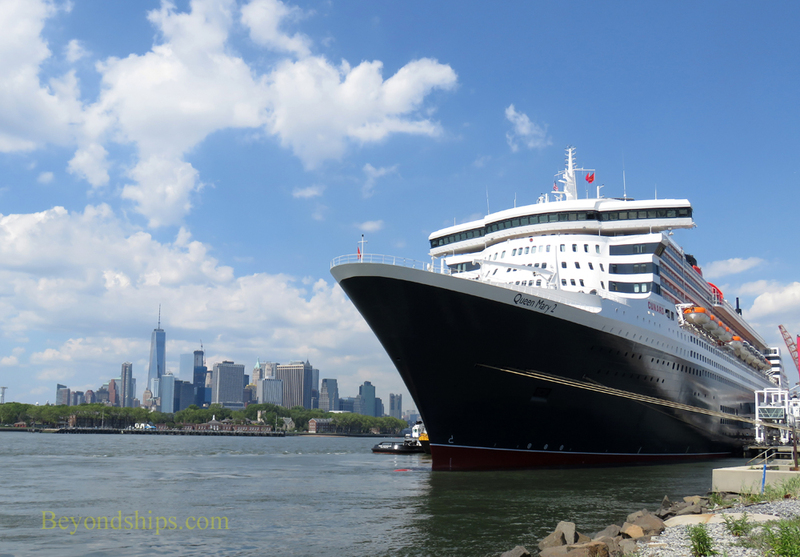 In May-June 2016, Queen Mary 2 underwent a major refurbishment. She spent 25 days in dry dock, 19 of them out of the water. Over one million man hours went into the effort, involving 1,200 crew members, 2,500 contractors and 1,500 shipyard workers. Part of the project was to refresh the interior of the ship. To this end, 594,000 square feet of carpet was laid involving 26 new carpet designs. Some 6,500 pieces of loose furniture and 4,000 framed pictures were brought aboard. Many of the existing public rooms were given a new look. Technical and structural changes were made. The ship remains the fastest passenger ship in service even though the gross tonnage increased to over 151,000 grt. The King's Court buffet restaurant was given a new open, more spacious design. In order to open up the King's Court, the glass elevators that ran from the Grand Lobby to the King's Court were removed. As a result, the Grand Lobby now has a more open look. New carpet with a bright design was laid down in the lobby. The Winter Garden was converted into the Carinithia Lounge. It is now both a bar and dining venue. It serves a light breakfast, lunch and afternoon tea. In the evenings there are small plates, wine and entertainment. The Todd English specialty restaurant is now the Verandah. A specialty restaurant developed by Cunard, it offers premium French regional cuisine. The room was given a décor reminiscent of the Verandah Grill on the original Queen Mary. The Queens Grill and Princess Grill restaurants received new decors. In addition, all 172 Grill suites were restyled and re-configured. 30 new Britannia Club balcony staterooms were added. These, along with some new inside cabins, occupy what was once an open deck area on Deck 13 that formerly included sports courts, a splash pool and the Regatta Bar. Accordingly, the Britannia Club area of the Britannia Restaurant has been expanded so that the Britannia Club is now on both the port and starboard sides. The sports courts have been moved back to the open deck area near the funnel. 15 single cabins were added. Six of these now occupy the area once occupied by the Photo Gallery on Deck 3L. These have two large picture windows in each cabin. The other single cabins are on Deck 2 taking part of the area that once housed the Casino. A new Photo Gallery featuring electronic screens is also on Deck 2 in part of the area once occupied by the Casino. (There is still a casino but it is smaller than before). The ship's kennel has been expanded so as to add 10 more kennels for dogs and cats. The outdoor animal play area has been enhanced with a New York City fire hydrant and a lamp post, which was originally located near the Cunard Building in Liverpool.